McCallum Bagpipes had an unusual visit from a film crew making the latest episode of a hit US TV show on Friday 26th November, 2010. Syfy’s Ghost Hunters International features a squad of paranormal investigators who use their principles of scientific techniques, to explore some of the most legendary haunted spots around the world. Each week the team travels to the far corners of the globe, searching for answers to bizarre supernatural mysteries. The show was featuring Inveraray Jail and the producers also wanted to visit a factory where bagpipes are manufactured in Scotland. 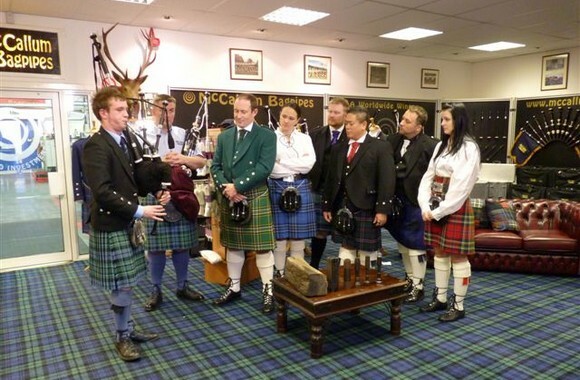 The show filmed the process of bagpipe making and interviews with Stuart McCallum. Inveraray & District Pipe Band member Geordie Hunter (who works at McCallum Bagpipes) was filmed playing a tune on the Great Highland Bagpipes and Iain Todd was filmed playing smallpipes. The show is set to be screened in the USA in February, 2011.